The lattice of a general crystal structure is determined by giving six lattice parameters, $a, b, c, \alpha, \beta,$ and $\gamma$. 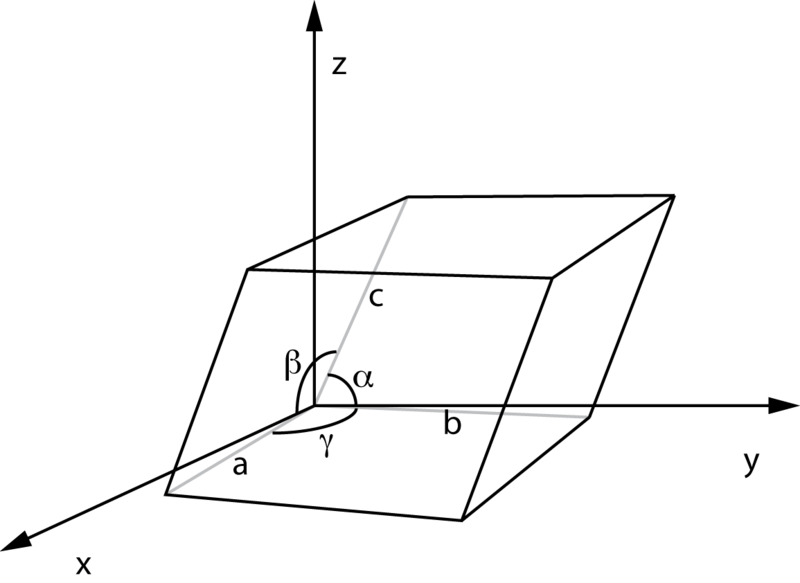 The first 3 parameters are connected with the length of the 3 primitive vectors of the crystal; the last 3 are the angles between the primitive vectors. The definition of the lattice parameters can be seen in the following figure taken from the wikipedia page on lattice constants. The values of the parameter ngridk in the input file have been chosen in order to allow for a fast calculation. Of course, the complete optimization procedure presented in this tutorial should be repeated for more accurate values of ngridk and the other computational parameters up to the desidered accuracy in the resulting lattice constants. In the next, we illustrate the iterative procedure for performing the optimization of the crystal structure of hexagonal Beryllium. The only relevant parameters in this case are the volume of the unit cell and the $c/a$ ratio. 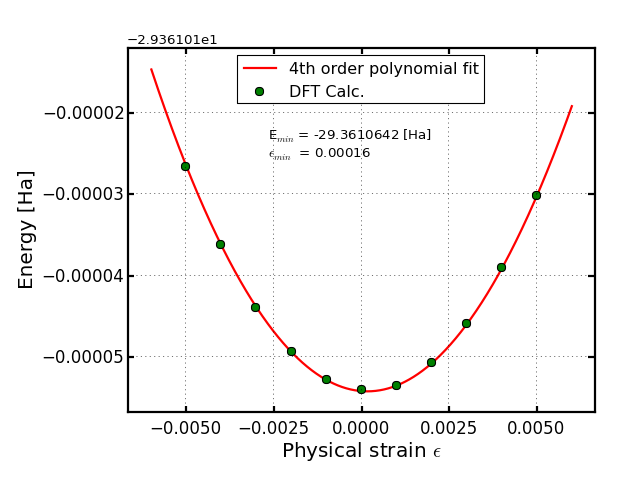 0.03, the absolute value of the maximum strain for which we want to perform the calculation. Optimized lattice parameter saved into the file: "BM-optimized.xml". 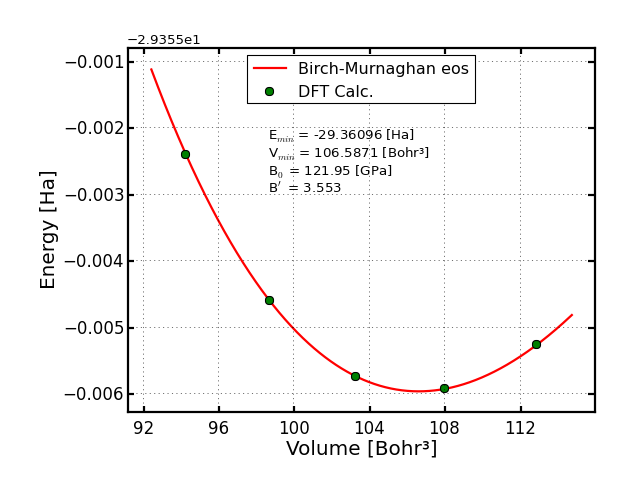 The BM_eos.out file, for instance, contains all final fit parameters and pressures which are calculated from equation of state fitting procedure. Also, the script generates a plot, PostScript (BM_eos.eps) or PNG (BM_eos.png) file, which looks like the following. 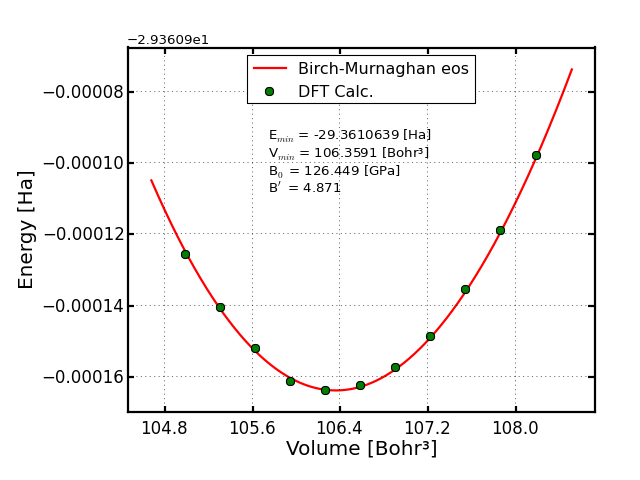 On this plot, you can also find the optimized values of the parameters appearing in the equation of state (minimum energy, equilibrium volume, bulk modulus, and bulk modulus pressure derivative). The bulk modulus and bulk modulus pressure derivative which are derived here have to be interpreted only as fitting parameters. This is due to the fact that in this tutorial we are changing the volume, however, we are keeping all other lattice parameter constant. 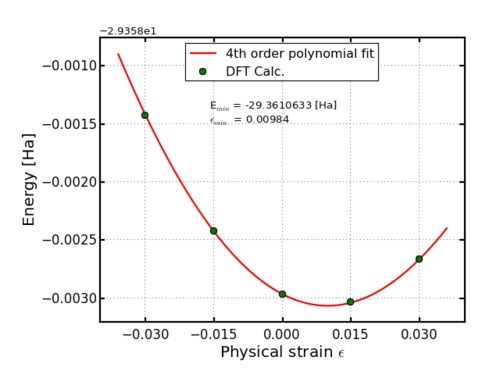 In order to obtain the real physical bulk modulus and bulk modulus pressure derivative, one has to fully optimize at each given volume with respect to all other lattice and internal parameters (e.g., in the case of hexagonal beryllium, with respect to the $c/a$ ratio, too). A file corresponding to an exciting input file for the optimized geometry is created with the name BM-optimized.xml. 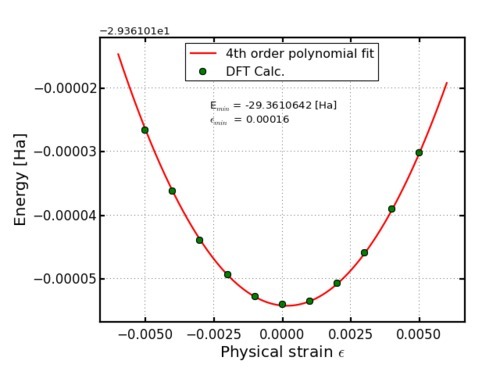 If you are interested to check how accurate the calculated equilibrium parameters at this step are, you can find more information here. Optimized lattice parameter saved into the file: "coa-optimized.xml". Repeat now the procedure already explained in STEP1, running the script OPTIMIZE-lattice.py and using as entries values 2-COA.xml, 1, 0.005, and 11 in the given order. After having performed the calculation (running the script OPTIMIZE-submit.sh inside the directory VOL), you run OPTIMIZE-lattice.py and get the following plot. Proceed in a similar way to to STEP2. Run the script OPTIMIZE-lattice.py using as entries values 3-VOL.xml, 2, 0.005, and 11 in the given order. Using the same procedure as in the previous steps, you will end up with the following plot. 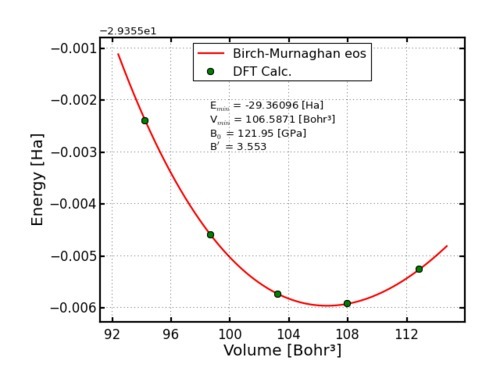 The equilibrium volume is converged within 2$\times$10-1 Bohr3. The c/a ratio is converged within 4$\times$10-4. The energy at the minimum seems to be converged within 3$\times$10-4 mHa. Indeed, such a small value should be considered an artifact of the optimization procedure, which assumes that the calculated total energies are exact. 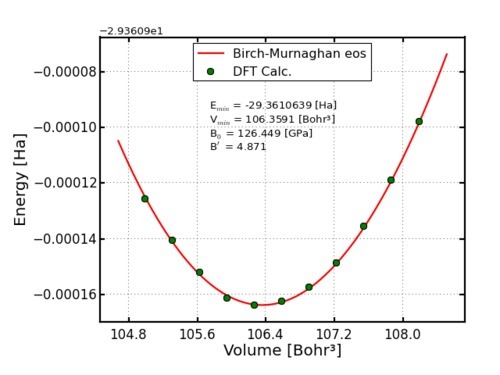 However, the accuracy in the determination of the minimum energy cannot be smaller than the accuracy of the total energy in a single SCF calculation. For the calculations performed in this tutorial, total energies are calculated with the default value of the accuracy, i.e., 10-3 mHa.